DAMMIT KIDS GET INTO THE MDX RIGHT THIS SECOND OR WE'RE GONNA BE LATE FOR SOCCER PRACTICE! DON'T YOU MAKE ME COUNT TO THREE! Ahem, sorry. 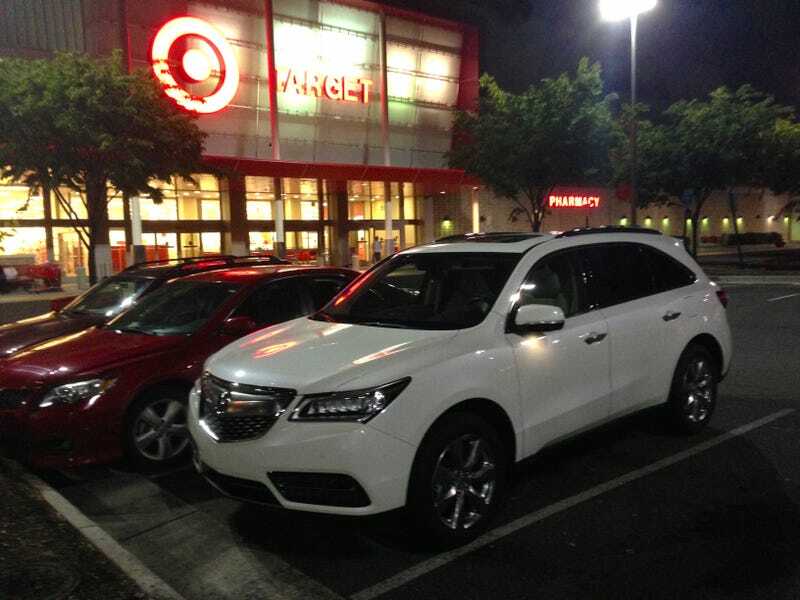 I have this white 2014 Acura MDX Advance with SH-AWD and the Entertainment Package for the next week. It's white with tan leather inside, and it makes me feel very parent-y. It's a hard car not to like, generally. In addition to the power rear folding seats, there's a separate rear sound system with its own headphones and a widescreen TV for DVD-watching. Great if you have kids, which I don't, but driving it makes me feel like I do. Or should. Anyway, my initial impressions are — HUNTER, HOW MANY TIMES DO I HAVE TO TELL YOU, STOP HITTING YOUR SISTER! IF I HAVE TO SAY IT AGAIN THAT FANCY NEW XBOX IS GOING STRAIGHT INTO THE TRASH! Whoa, sorry. Things I like so far: It's comfortable and roomy, overall fit and finish is excellent, the 3.5-liter 290 horsepower V6 sounds great and has a decent amount of hustle, 6-speed paddle shift gearbox is sharp, and handling is respectable for this class. Gah, weird! So weird. Anyway, things I don't like as much: The Acura shield still looks terrible, it's not as sporting as some luxury SUV competitors, it doesn't feel really that much more premium than the loaded Accord Hybrid I had recently, and ultimately it's kind of boring to drive. Sticker's $57,400. Expect a full review next week, probably in Truck Yeah! And feel free to drop some questions into the comments and I'll get to them as I can.